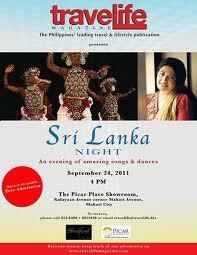 Watch Sri Lanka's top performers including their famous songstress free in Travelife's Sri Lanka Free Public Performance on September 24 (Saturday), 4PM at The Picar Place Showroom. Organized by Travelife Magazine together with the Embassy of Sri Lanka, this is surely a night of cultural event that should not be missed! Alexander House 2F, 132 Amorsolo St.